Sleek and contemporary on the outside, yet reassuringly Provencal on the inside, Villa La Coste is as stylish as it is authentic. 28 Villa Suites encased in glass and looking out over gardens, herbs and flowers offer ultimate relaxation whilst a stunning Restaurant serves up organic produce and a Spa soothes all your stresses away. Whether it’s Cezanne or the Cotes de Provence that brings you here, Villa La Coste proves to be the most stylish stay. High on the hillside of its private Domaine, Villa La Coste sits picture-perfect between Aix en Provence and the Luberon Nature Park. A 45-minute private transfer from Marseille Airport or half an hour from Aix en Provence train station, it’s the perfect pit stop on a trip from Paris down to the Cote d’Azur. But why stop at a few nights? Why not simply stay for the week? 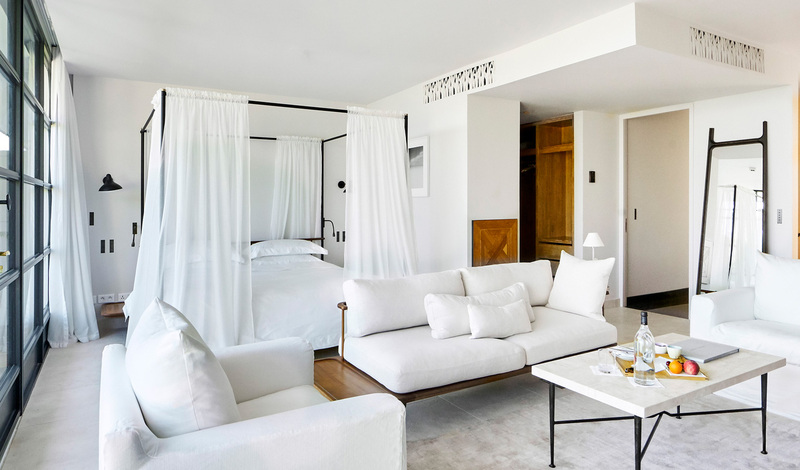 Flooded with light and adhering to an all-white colour scheme, the 28 Villa Suites combine light woods, marble and natural stone to create a zen-like environment in which to relax. With neutral tones offset by the hues of the Luberon Valley, the result is a natural warmth and an incredibly spacious feel. Further adding to that home from home feel, each suite also comes with its own private terrace, whilst some also feature private plunge pools. Inside, the cloud-like king size beds and deep soaking tubs tempt you into days of never leaving your room – and we wouldn’t blame you. Any hotel that comes with its own vineyard is a winner in our eyes. Set within the heart of the biodynamic Chateau La Coste vineyard, Villa La Coste is revealed as a destination of international standing for art and viticulture. Taking its cue from modern vineyards seen in the likes of Napa, head down to the contemporary Chai buildings and learn more about the innovative wine-making process before sampling the results yourself.